First thing’s first, I’m new to this blogging business, you may have noticed from the shoddiness of my page. Things will improve over time, of that I’m confident, but for now, forgive me for the unprofessional aesthetics! Second thing’s second, I want to make the point that whilst I love food and eating, I’m not an amazing cook. I don’t think for a second I’m going to make a convincing Nigella, I’m more a person who likes to cook and can just about find her way around the kitchen. Sometimes, occasionally, my dishes don’t go to plan. Edible, but not perfect. 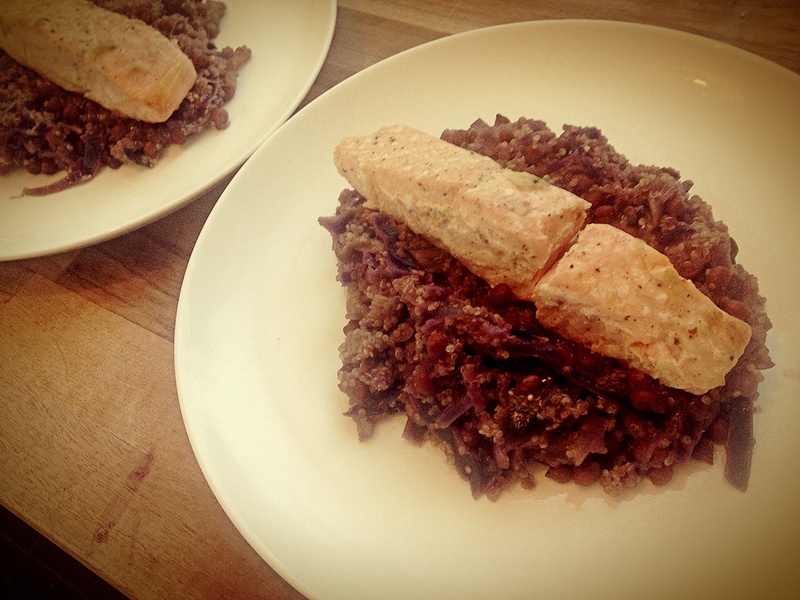 If you’ve guessed that a blog about a substandard dinner is coming…bingo, you’re correct. In the spirit of a ‘warts and all’ blog, I won’t be hiding the clangers. Anyway, on with the blog. When shopping yesterday, I inadvertently pre-empted today’s distinctly fishy headlines. 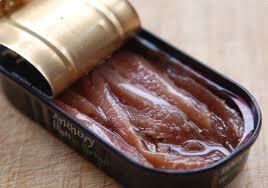 “Eating oily fish ‘can extend life'” Telegraph and “Cod and chips could be a load of old pollock” Guardian. My favourite is the latter, an excellent use of pollock innuendo. I never buy fish because I’m not to confident with it, but yesterday cod, salmon fillets and anchovies went into the trolley. Here’s hoping I have a knack for predicting lottery numbers as well as headlines. The anchovies and the salmon were eaten yesterday, you heard about my anchovy omelette breakfast and I’ll detail my salmon dinner below. The cod went in the freezer as it was a yellow sticker buy. Does anyone have any suggestions as to how I should cook it? I think they were loins? Can you even get cod loins? I can’t be bothered to go to the freezer to check, so we’ll go with loins. Let me and any readers know of any cod loin recipes you can think of please! Having uploaded the photo, it doesn’t look terrible. Admittedly, I used a funky app to take the picture, which made my salmon look pretty pale, well, paler. Then I was worried my dinner was getting cold so I gave up. It actually tasted pretty nice, and given this is the first time I’ve cooked quinoa, I’ll forgive myself for it being a little water logged. The quinoa is part of this gluten free thing we’re trying. You’ll see that I haven’t given any measurements or anything, I tend to just throw things in. 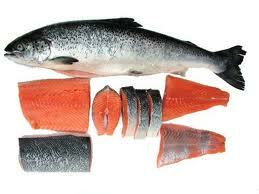 Wrap your salmon into a tin foil parcel with a splash of lemon, oil and a crushed garlic clove. Season to taste with salt and pepper. Let your oven preheat and heat a pan to the low side of medium. Thinly slice a garlic clove or 2, I like a lot of garlic. Heat your garlic slowly. Before it starts to colour, add your sliced onion and turn the heat up a little. Add your cabbage and turn the heat up a little more, then add your mushrooms. Way before things start to over cook, whilst they look like they still have a good bit of bite, add your, celery, brown chickpeas, quinoa and stock, 1 part quinoa 2 parts water, I judged this by eye, in the pan with everything else in it too. The end result was soggy so the advice is not to be lazy like me and actually measure your quinoa and stock. Bring the pan up to boil then turn down low and simmer. 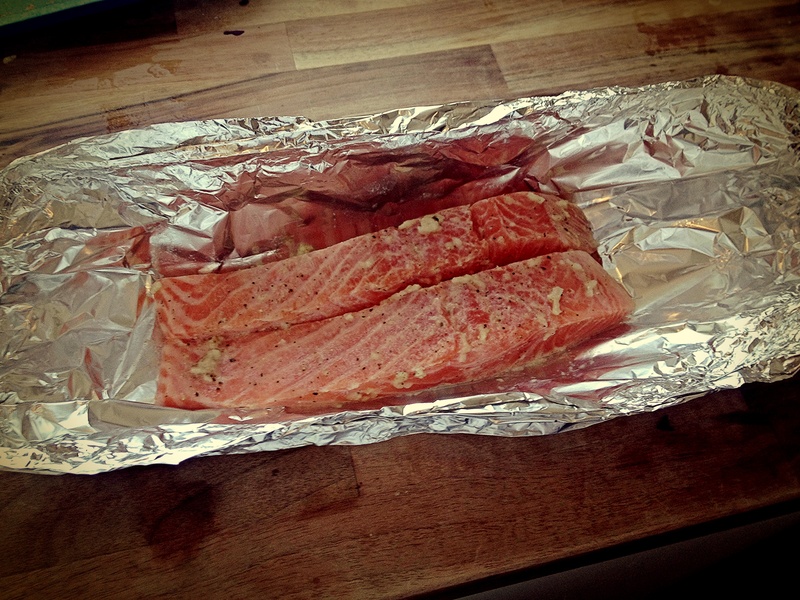 Stick your sealed salmon foil parcel in a medium oven to steam whilst your quinoa cooks for about 20 minutes. So what if my cabbage stained everything an unappealing shade of purple. So what if my quinoa was more moist than fluffy. So what if my salmon looked like it needed a sunbed. It tasted glorious, the salmon was perfectly pillowy and moist. I’m pretty open to suggestion though so please don’t be shy with the advice. That was yesterday’s dinner. Tonight’s was really good. I’ll fill you in soon. 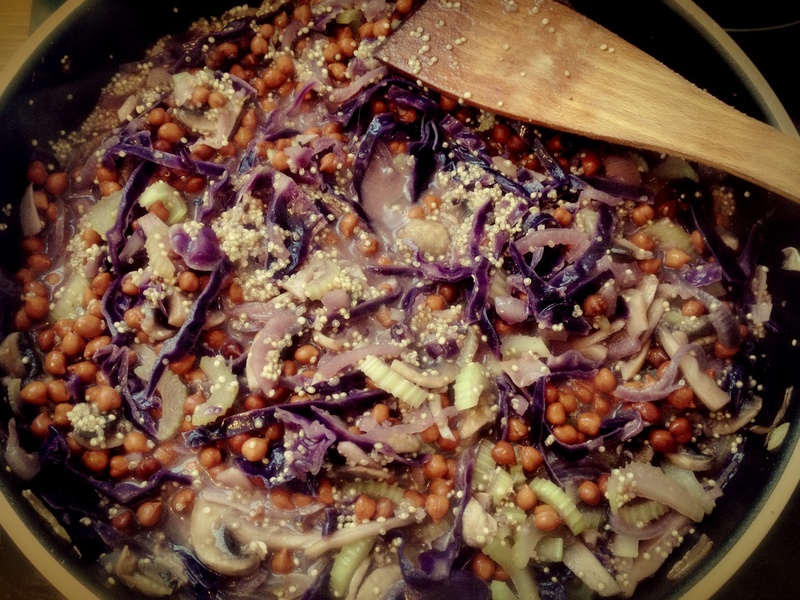 This entry was posted in Uncategorized and tagged after work, anchovy, chick pea, Chickpea, cod, Cook, couple, dinner, Family, food, Garlic, Nigella, oily fish, Olive oil, quick dinner, Quinoa, recipe, red cabbage, Salmon on April 2, 2013 by sheeatsyummyfood.